It’s the season of romantic comedies again. Taking the lead in box offices is About Time, produced by Working Title Films of England which is well-known for its hit movie, Love Actually. A mixture of time travel and romance, About Time went on 568 screens nationwide on the 5th and ranked first in box-office chart during its first two weeks, defeating another spin off of Lord of the Rings, The Hobbit: The Desolation of Smaug . A total of 1.60 million people have watched About Time so far. A week later, when The Hobbit: The Desolation of Smaug was released on the 12th , it had to face a misfortune of not being able to settle on distribution of profits with multiplex theatres. However, Lord of the Rings fans are not bothered. The Hobbit: The Desolation of Smaug came in first in its first weekend, gathering 820,000 viewers, against a tough competitor, Way Back Home. The accumulated admissions is 1,200,000. A day before The Hobbit: The Desolation of Smaug came in the market, Way Back Home hit the screens. It is a teamwork of the director and an actress, PANG Eun-jin; the Queen of Cannes, JEON Do-yeon; and the distributor, CJ E&M. Based on a real story of a lady who was arrested at the Orly Airport in France for suspicion of transporting drugs and spends the next two years in jail without being tried in court, the film is catching public’s interest as it conveys criticism on governmental authority. During the first weekend of opening, 610,000 people have watched the movie, recording 2nd in box-office sales, but it is close behind The Hobbit: The Desolation of Smaug with a total of 1090,000 viewers so far. 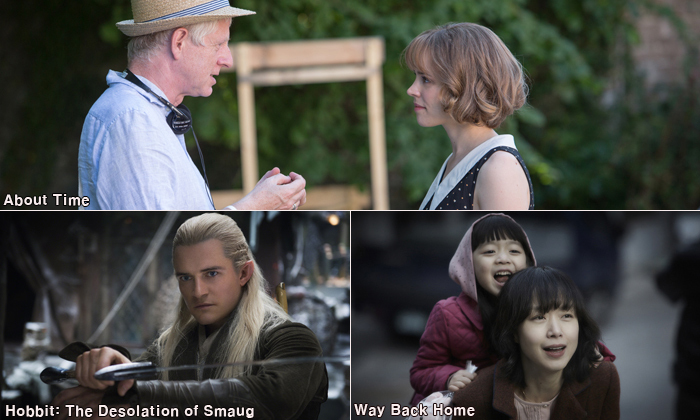 Two very different movies distributed by Sony Pictures and Disney Pictures have made favorable take-offs. In its first weekend count, a horror movie, Insidiuous, Chapter 2, came in second, after About Time. Targeted for audiences coming with their families, Cloudy with a Chance of Meatballs 2 is on a steady rise since its release on the 21st of November; adding 280,000 admissions during the last two weeks, more than 790,000 people have watched the film so far and it is maintaining 409 screens. Korean movies that have relied on machoism aren’t lasting long in the market. KWAK Kyung-taek’s Friend: The Great Legacy is ready to slide off the chart with 2.96 viewers up to now, including 140,000 during the last two weeks. 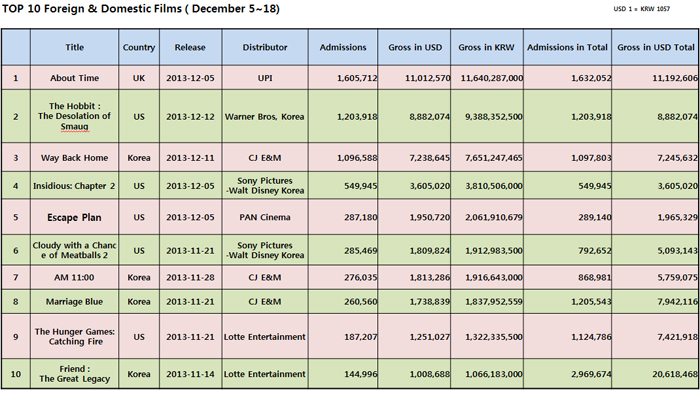 A thriller, AM 11:00 by KIM Hyun-seok has to settle with just over 860,000 admissions since its release. Commitment, which attracted 1.04 million people in total is also wrapping up. Among some diversity films, Lazy Hitchhikers’ Tour de Europe and Promised Land stand out. Lazy Hitchhikers’ Tour de Europe, a documentary about four youngsters hitchhiking through Europe for one year, recorded 15,881 audiences in just 21 days of showing. Since its first screening on the 12th, Promised Land which is directed by Gus Van Sant, met with 9,269 viewers.